How the New Google Dealer Playbook Can Help Car Dealership Marketers Get the Most from Their Digital Advertising Platforms. At LotLinx, we’re constantly evolving, offering automotive marketers new tools and innovations that can help them sell more cars online. Global tech giant Google – widely known for their own non-stop innovation – is also focused on giving automotive marketers more and better resources. 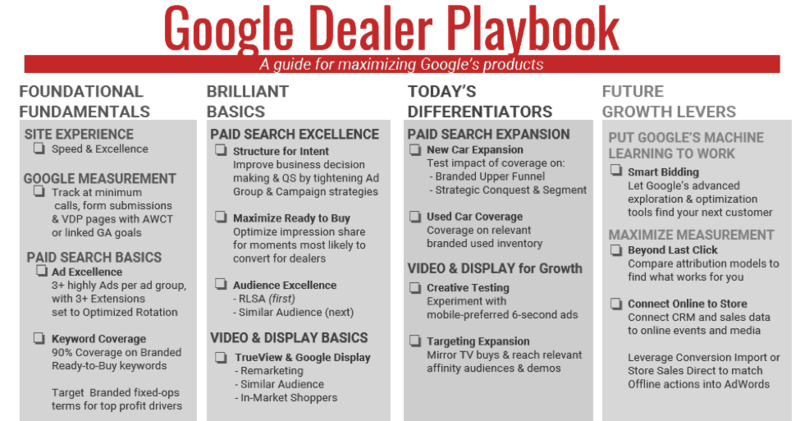 It’s important for dealers to work to stay up-to-date with Google’s latest developments, and the release of the new Google “dealer playbook,” offers a simpler way to get more from Google’s ever-expanding suite of tools and resources. A big debut at DD23. The playbook was previewed at the recent Digital Dealer Conference and Expo in Las Vegas, with a full release expected soon. The company’s goal is to help automotive marketers (and their agencies) gain actionable insights into what today’s car shoppers want from their digital experiences. Additionally, the resource will provide insight into maximizing the benefits of individual platforms, and provide a better understanding of measurement capabilities. Making sense of the options. As a recent article in Automotive News explained, gaining this new level of understanding and knowledge about Google’s offerings will help dealers determine the features, targeting options, and products that will bring in the biggest benefits. A simple structure for a complex subject. This structure gives marketers a clear, concise understanding of the range of potential strategies and actions they can or should be taking, beginning with things that are considered basic and instrumental, and ending with what the most forward-thinking dealerships can do to set themselves apart and chart a path toward growth. The right approach to GA.
At LotLinx, we’ve long been committed to helping automotive marketers make the most of the mountains of data Google can produce. It begins with a laser-like focus on the most valuable insights, gained from the nine Google Analytics goals that our team worked hard to identify as most important to track. Setting up those goals in a Google Analytics dashboard is the most effective way to accurately measure website activity, and parse the extensive amount of data available to determine the actionable insights that lead to smart decisions, along with increased conversions, engagement, and sales. We offer complete instructions to complete the GA setup on your own. Alternatively, a LotLinx Digital Strategist would be happy to walk you through the process. There’s certainly no doubt that Google’s offerings will continue to increase and evolve. Which makes the playbook is a timely and welcome guide for any automotive marketer who understands the importance of keeping on top of their most important resource.